The city of Baltimore, its citizens, and its businesses should pay close attention to solid waste and recycling management; it impacts the city’s economic bottom line and its public health. Baltimore’s system for managing waste and recycling is well within the acceptable operational and cost parameters for cities in the mid-Atlantic region. Waste is sent to a convenient, privately owned downtown incinerator at a cost of between $50-$55 per ton. These costs will hold for the next few years, although there are pressure points along the way. If the incinerator operates for more than the estimated five years, the city will have to invest in an expansion of the Quarantine Road landfill at the southern tip of Baltimore, where the ash from the incinerator is deposited. The city is paid for receiving this ash; this helps lower the overall cost of using the incinerator. However, in the next five years, the incinerator company may have to invest up to $70 million in air control equipment; this will significantly increase the cost of operation. As a result of rising commodity prices for recycled materials, Baltimore’s current cost of recycling is $20 per ton. The city has the opportunity to reduce the overall cost of solid waste management by $30 per ton for each additional ton that citizens recycle. The city recycles just over 20% of its materials, leaving plenty of room to grow. The national average for cities is 35%, but some cities have gone beyond 70%–double the national average. Baltimore can double its recycling rate within two years by adopting a few simple measures. These include: unit pricing for garbage (also known as Save Money and Reduce Trash (SMART), Pay As You Throw, (PAYT), or Save As You Throw (SAYT)), community scale, backyard composting, and new rules requiring construction and demolition companies to recycle materials in a cost effective way. 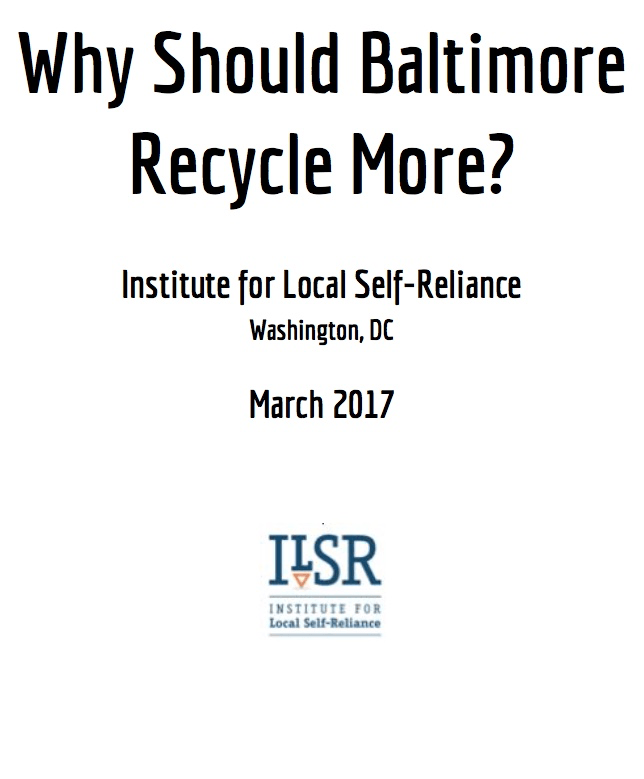 ILSR’s March 2017 report, “Why Should Baltimore Recycle More?” explores these and several other successful strategies that are considered best practices in cities across the US. Combined, these state-of-the-art measures will create 500 jobs within two years. The same infrastructure for recycling, reuse, and composting can carry the city to over 70% recycling, edging closer to the 90% goal, which is considered Zero Waste. 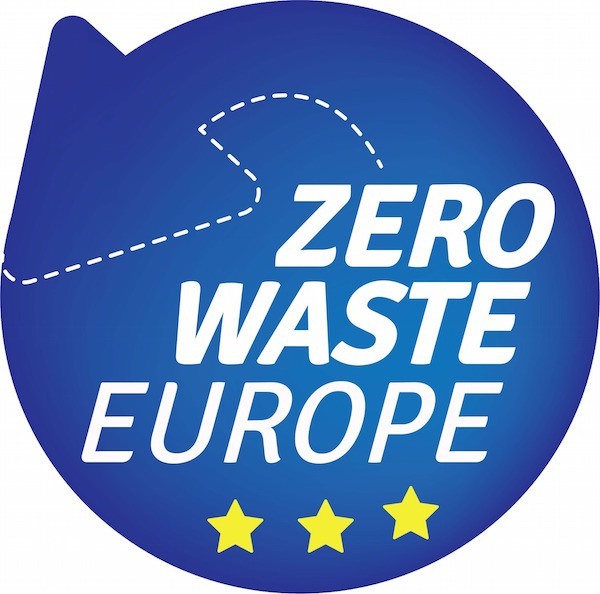 These high levels of recycling can dramatically reduce the city’s per capita generation of garbage, as well as the costs associated with managing that garbage. In Worcester, MA, a comprehensive recycling program has saved the city $99 million since 1993. The program principally implements unit pricing for garbage collection and avoids using a nearby garbage incinerator. Los Angeles, Portland, Seattle, Oceanside, San Jose, Alameda and San Diego Counties are already at or approaching 70% recycling. This is due to a mobilized electorate that voted for new rules that favor recycling over wasting. Recycling creates good, steady, jobs. Reuse is the most labor-intensive process, and it creates the most value from used and refurbished products. Small businesses also benefit from focusing on reuse and refurbishment. Composting indirectly creates jobs when compost is available in the mid-Atlantic market. The city of Oakland has created 1000 jobs related to recycling, reuse, and composting. Every small increase in recycling levels means a significant increase in jobs. While there is no immediate crisis facing Baltimore’s waste and recycling system, changes still must be made to stimulate small businesses and create good jobs, which are sorely needed for the city’s tax base. There are compelling opportunities to capture low-hanging fruit, and this approach has proven successful in both large and small US cities. Baltimore is in the midst of a public health crisis. The downtown garbage incinerator is an aging facility with inadequate air pollution abatement equipment. The facility is tested just once per year, and this test measures only a few of the known pollutants that are emitted from the stacks 24 hours a day. The incinerator is the leading polluting facility in the Baltimore metropolitan area. According to detailed testimony by the Energy Justice Network and Physicians for Social Responsibility before the Baltimore City Council on May 16, the oxides of nitrogen (NOx) emissions are the leading cause of asthma in the city. This translates into increased visits to emergency rooms, absenteeism from school, and health risks for infants and the elderly. These issues have been brought to the public’s attention as a result of the Curtis Bay community’s three-year battle to stop a 4000-ton-per-day garbage incinerator. The Westport community immediately adjacent to the downtown incinerator suffers the most, but these issues affect the entire city, region, and world. The Mayor is committed to increasing recycling and reducing, and may even halt Baltimore’s use of the incinerator. This will not, however, alleviate the pollution issue; .the incinerator is privately owned and can burn hundreds of thousands of tons of garbage each year from nearby jurisdictions in Maryland, New Jersey, and Pennsylvania., without adding proper pollution equipment. State emissions limits and testing procedures are not adequate enough to protect the public. This threat can be stopped only by passing more stringent air regulations than Maryland currently has in place. The Energy Justice Network in Washington, DC, has expertise in this area. Baltimore can change the garbage landscape in the coming decades by investing in source reduction, recycling, composting, and reuse. These investments will create more jobs and small businesses, reduce budgets, and improve health. Two adages pertain to Baltimore’s garbage future. The past 50 years of recycling in the US proves that “the hardest thing to do in recycling is to decide to recycle. From then on, entrepreneurialism and common sense take over.” Baltimore businesses embody this idea. The Loading Dock, Humanim, and Second Chance are three non-profit enterprises that began deconstructing buildings and selling used building materials well before these practices were commonly accepted business activities. They created several hundred new positions, the majority of which were filled by unemployed, underemployed, and hard-to-employ residents. People, as well as materials, have had a second chance at success. Government initiative has also stimulated economic growth: Baltimore’s wood recycling enterprise at Camp Small, run by the Division of Forestry, makes mulch and logs from city streets and parks available to private companies at very reasonable prices. City officials, organized citizens, and the business community have an open opportunity to use publicly owned raw materials to realize economic and public health goals. Neil Seldman, Ph.D., is cofounder of ILSR and director of its Recycling and Economic Growth Initiative. He specializes in helping cities and counties.recover more materials from the waste stream and add value to the local economy by processing materials and manufacturing new products.